"if i have the photo of the person, can you turn it into a caricature with marker theme that can be sized down for us to insert on a name card (small sized)? 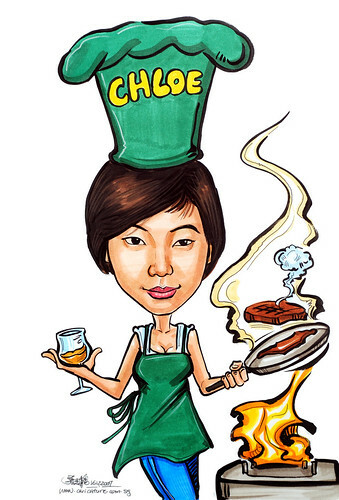 ...Also need to have the caricature done with a chef hat, apron, wielding some cooking utensils on one hand and a glass of champagne on the other. ...Are you able to do the chef hat and apron in green colour please? A nice dark green and also, on chef hat or apron (either one) to indicate "Chloe". Chef's apron over white or black tank top. If can't see tank top, then just the apron will do."